NASA hassuccessfully revived its powerful Mars Reconnaissance Orbiter from a protectiveslumber following a glitch that silenced its science observations last week. 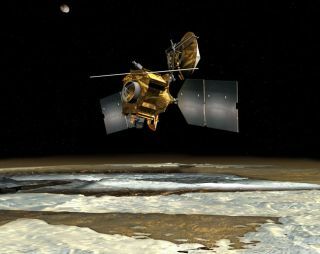 Thespacecraft, which has been orbiting Mars since 2006, resumedits work to map and observe the red planet on Tuesday after days ofhibernating in a precautionary safe mode. ?Engineersbrought the spacecraft out of the standby mode on June 6,? said mission managers atNASA?s Jet Propulsion Laboratory in Pasadena, Calif., in a statement. ?Camerasand other scientific instruments resumed operation June 9." The Marsorbiter wenton standby on June 3 after suddenly rebooting its main computer in a malfunctionengineers suspect was caused by a hit from a stray cosmic ray or solarparticle. It was the sixthtime the orbiter has entered safe mode, which is a self-defense mechanism thatallows the spacecraft to essentially shut down and await instructions fromEarth when a situation arises that its autonomous functions do not have aspecific response for, mission managers said. NASAengineers initially thought the culprit behind the Mars Reconnaissance Orbiter?srecent computer malfunction was similar to the source of a Feb. 23 glitch,which they attributed to a cosmic ray or solar particle hitting the spacecraft?ssensitive electronics and causing a false power spike reading. But now they arenot so sure. ?Engineers arere-investigating possible root causes for both events,? mission managers said. ?Thenew investigation includes reconsidering the likelihood of erroneous voltagereadings resulting from cosmic rays or solar particles hitting an electroniccomponent.? NASA?s Mars ReconnaissanceOrbiter launched in 2005 and arrived at the red planet a year later. It is the youngest orbitercurrently circling the planet and has beamed home more data about Mars than allother Mars missions combined, NASA officials said. The $720 million orbitercompleted its initial two-year mission in 2008 and is currently in the midst ofan extended mission that runs through 2010. In addition to mapping andobserving Mars, the orbiter?s high-powered main camera has been hunting forpotential landing sites for NASA?s next big mission, the nuclear-powered Curiosityrover, which is slated to launch in 2011. While engineers worked torecover the Mars Reconnaissance Orbiter, another team is drawing plans to haulthe waylaid Marsrover Spirit out of a deep sand dune on the planet?s surface. Spirit has been stuck up toits six hubcaps in deep sand for more than a month, though its robotic twin Opportunityis currently doing well on the other side of Mars. Both long-lived rovers havebeen exploringMars since they landed on the planet in 2004.